Iridian has the capability to manufacture standard filter types (AR, beamsplitters, bandpass and edge filters) in the SWIR (1.4-3 µm), MWIR (3-8 µm) and LWIR (8-15 µm) spectral ranges. Iridian’s SWIR and MWIR coatings (and some LWIR coatings) are primarily deposited by sputtering which makes them very robust. For the LWIR coatings above 10 µm, ion-assisted evaporation of non-oxide materials are typically used. 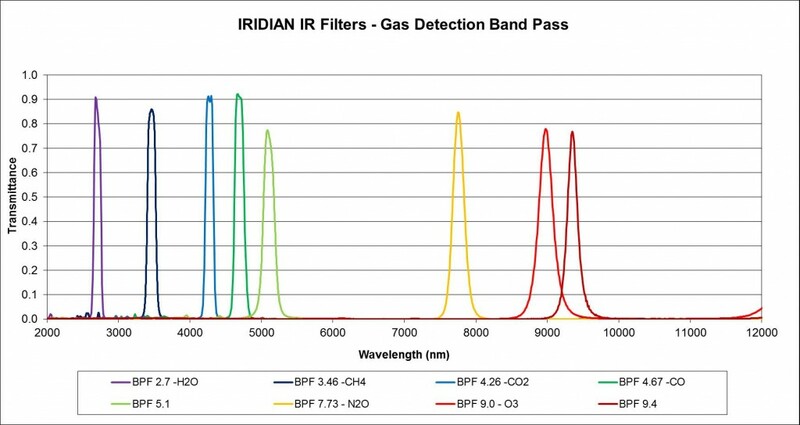 As one example of IR filters, Iridian supplies off-the-shelf band pass filters for many of the spectral bands commonly used for gas detection. Some examples shown below include H20, CH4, CO2, CO, N2O, and O3. These cover, but are not limited to, the 2 – 12 µm range (see chart below). Other transmission bands can be supplied for custom order. The filters offer high transmittance over the spectral regions of interest and high blocking across the rest of the operating wavelength range. Other types of IR filters include short-pass filters designed for the MWIR and LWIR spectral ranges, (Iridian recently shipped over 6000 filters of this one IR product alone); long-pass filters; beam-splitter filters and anti-reflection coatings for the SWIR, MWIR and LWIR.